Last Whispers (www.lastwhispers.org) is a project about a mass extinction of spoken languages, conceived of and directed by artist and photographer Lena Herzog. The immersive sound and video installation premiered at The British Museum in the Living & Dying Gallery adjacent to The Rosetta Stone during the Bloomsbury Festival, 21 October 2016. The VR experience premiered the 2019 Sundance Film Festival with the New Frontier Exhibits. It is scheduled to show next year at various museums, theaters and concert halls as a one-hour public concert event to a seated audience or as a site-specific museum installation. 2019 is an auspicious year for this event as it was declared by the UN General Assembly and UNESCO as The Year of Indigenous Languages. UNESCO Atlas of World Languages in Danger is co-presenting the work. Last Whispers is a 501(c)(3) non-profit organization which also collects and comprises stories from the last speakers of languages and the linguists who preserve them. 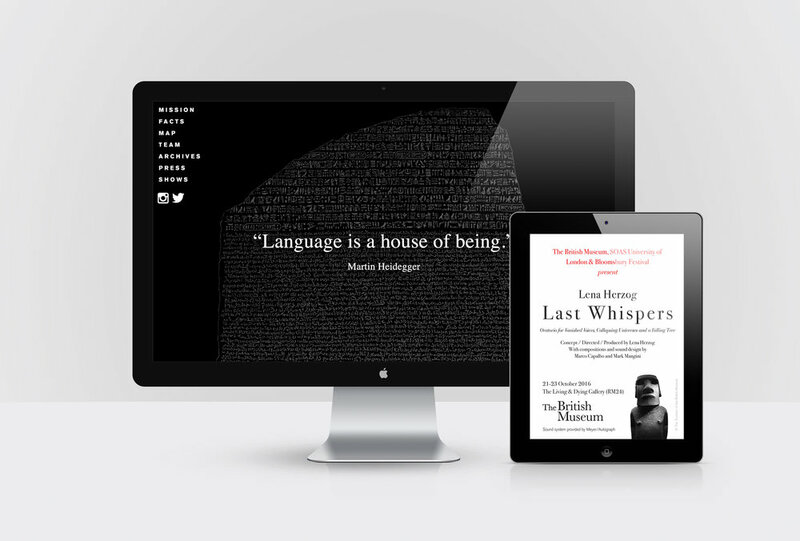 I created the identity for Last Whispers, as well as the streaming video, parallax website, www.lastwhispers.org, the opening and closing credits and subtitles for the accompanying film and all collateral materials for exhibition announcements and social media. I also serve on the board of Last Whispers.org as co-director.